A Lock of Hair Swept off to the Heavens… on an Ostrich? In 19th-century and early 20th-century Anglophone research, the use of ostriches for riding in Mediterranean / Egyptian antiquity seems to be unquestioned. In 1869, North Pinder (38) presented a convoluted argument positing that the presence of an ostrich-riding statue in Greece allows us to assume another one like it “in the temple dedicated to Arsinoe-Aphrodite on the promontory of Zephyrium in Libya”; that ostriches were a favored animal with the Ptolemies; that this supposed statue allows us to connect two seemingly separate phrases in one particular poem and – because ostriches might be a part of a group of mythological birds called the Memnonides – to assume that an ostrich appeared as a kind of divine courier in that same poem; and, finally, that ostriches were “to Arsinoe-Aphrodite what the Caledonian boar was to Diana […] or the eagles to Jupiter” – i.e., sacred animals and/or helpers connected to the deity. Pinder was commenting on a poem now known as Berenice’s Lock, translated into Latin by Catullus (ca. 84 to 54 BCE); the original was written in Greek by Callimachus (ca. 305 to 240 BCE). Callimachus was a poet, critic and scholar associated with the Library of Alexandria. Not only was Callimachus a contemporary of Arsinoe II, but, like his contemporary Callixenus of Rhodes (see Part 3), enjoyed the patronage of King Ptolemy II Philadelphus, her brother and third (and last) husband. Berenice’s Lock was a part of a collection of poems named Aetia, probably written in the course of Callimachus’ life between 270s and 245 BCE. 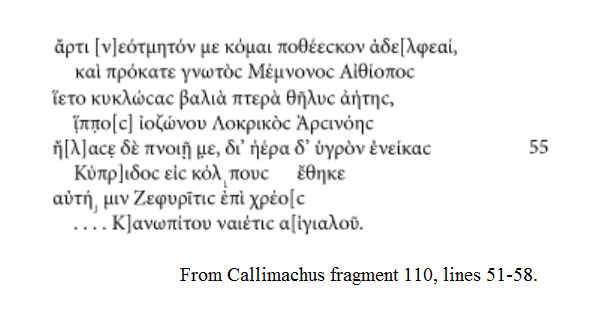 Only fragments of Callimachus’ Greek version exist, so up until recently, Catullus’ Latin version (also known as Coma Berenices or, simply, Catullus 66) was often used for analyses even though it’s known that he wasn’t always a literal translator (see e.g. Clayman 2011, Harder’s article Callimachus 98, Pinder 34). If Pinder’s argument is right, this sounds like a fantastic source for the history of ostrich riding. Even if he were wrong, it might nevertheless prove a valuable source since the original Greek poem dates from the decades immediately after Arsinoe’s death and mentions her by name. Although Berenice’s Lock is a fantastical poem, it refers to historical events: the plot is dependent on the safe return of Ptolemy III from the Third Syrian War in 245 BCE (see Clayman 2011). On Ptolemy III’s return, Berenice dedicated a lock of hair – the poem’s narrator – at the temple of Arsinoe-Aphrodite at Zephyrium. (Arsinoe II was deified, and after her death she was connected with the goddess Aphrodite and continued to be worshiped in numerous places.) The lock was taken into heaven and became a constellation. It’s clear that Catullus didn’t use the Latin word for ostrich, struthio or stuthiocamelus. Where does Pinder’s ostrich interpretation come from, then? Pinder’s text doesn’t deviate from the Perseus version apart from one instance: where most Catullus 66 manuscripts read obtulit Arsinoes elocridicos, his version follows an earlier emendation that makes line 54 into obtulit Arsinoes Locridos ales equus. Unfortunately, Pinder doesn’t provide a translation of his own but only reproduces the Latin text with his notes. Latin poetry is notorious for its convoluted word order and strict metric requirements, which indeed doesn’t help here. From the earliest editions on, this Catullus passage has also been widely described as difficult to interpret. There is, understandably, a wide variety of translations as well. And in chaste Venus’ breast drops he the present he bears. Even though the literal translation of ales equus is ‘winged horse’, it’s therefore technically possible that the implied referent is a (mythological) bird large enough to use as a mount, as some sort of poetic mashing-together of a metaphor and a metonymy. I would love to see Pinder’s translation into English, for my Latin is way too rudimentary for a complex sequence like this. I cannot help but notice, however, that all of his ostrich arguments are phrased as conjecture (appears; supposed; might; would; might) with very little physical or contextual evidence. Of course, that’s the unavoidable nature of research into millenia-old materials, but there are times when the meager amount of credible, comparable sources is very frustrating. Also Harrington (78) in 1914 states that the phrase ales equus “probably [means] the ostrich”. Flying horses abound, but these translations don’t offer a solution to the ostrich issue. He explains that “[t]his is based on the speculation that the manuscript elocridicos may be a corrupted form of elogium or eloquor” (along the lines of ‘utter, express, speak out, declare’) but says his understanding of Latin meter is not good enough to say whether there is any metrically viable form that could be read in. What about the original Greek, then? The text isn’t in Perseus, nor is it easily available either online or physically without access to a large academic library. There is a brand new edition, though, published in 2012 by M. Annette Harder called Callimachus: Aetia: Introduction, Text, Translation, and Commentary. I’ve only had partial access to it, though; neither the Google Books preview I was able to skim nor the Look Inside feature on Amazon includes lines 51-58. However, a few years earlier Acosta-Hughes published a book on Hellenistic poetry where he discussed Berenice’s Lock and included the original Greek for lines 51-58 (2010, 63-64). (In fact, I looked at his interpretation of Zephyrus and Memnon, above.) Finally, after some whiplashing, a break! From Benjamin Acosta-Hughes, Arion’s Lyre: Archaic Lyric into Hellenistic Poetry, Princeton, NJ: Princeton University Press, 2010, pp. 63-64.
to set me in the bosom of Aphrodite. Apparently, violet-girdled means that she has flowers in her belt, and not a belt of purple color. On the basis of the English translations alone, I would’ve totally just assumed the color interpretation to be correct, which shows the importance of looking at originals! The word-for-word phrase to describe Aphrodite is the Cyprian one, which is one of her standard epithets. Most intriguingly, though, what became ales equus in the Latin version of Berenice’s Lock seems to have been Catullus’ phrasing: in the original Greek, “a horse (hippos) and his wings (ptera) are referred to separately. He is not called a winged horse, nor is the word strouthos here anywhere”, according to Erik. What we seem to have is a case of poetic ambiguity (by Callimachus) translated with poetic license (by Catullus), taken uncritically as evidence (by 19th-century and early 20th-century writers like Pinder, Merrill, and Harrington). It seems there was at one time a statue of Queen Arsinoe II atop a large bird, but it wasn’t in her tomb. The one extant description of the statue dates from four centuries after Arsinoe II’s death. According to that description, the bird she rides is an ostrich, but later interpretations cast some doubt on the identification. Ostriches were certainly known in Egypt during the Ptolemaic period when Arsinoe II lived and appear in both visual and textual sources. A description of a Grand Procession put together by Arsinoe II’s husband-brother Ptolemy II includes eight chariots drawn by pairs of ostriches, and the ostriches may have been ridden by boys in costumes. Even a cursory look reveals that the history of the Greek word for ‘ostrich’, strouthos, is complex. As there are no immediate red flags in the descriptions of Arsinoe II’s statue or Ptolemy II’s Grand Procession, these two pieces of textual evidence remain in play. The poem Berenice’s Lock was said to contain further evidence of ostriches as mounts in Ptolemaic Egypt after Arsinoe II’s death. That claim is based on an erroneous reading of the Latin translation, however; the Greek original has no references to ostriches whatsoever. Whether you accept the ostrich connection or not, Berenice’s Lock remains in the mythological realm despite its basis in historical events. The ostrich may have been a favorite bird with the Ptolemies so much so that it was incorporated into art and poetry as part of their imperial propaganda, as the 19th- to early 20th-century European literature seems to suggest, but a confirmation would take an even more detailed study of extant texts and visual sources than is possible for this post. Finally, we still don’t seem to have any new examples that support the idea of humans riding ostriches in the real world. With regard to the history of ostrich riding, then, Berenice’s Lock is a dead end. Pausanias’ description of the statue of Arsinoe II in Helicon (9.31.1, cf. Part 1) and Callixenus’ of Ptolemy II’s Grand Procession (cf. Part 3) remain the best potential sources for the history of ostrich riding in antiquity. Again, a confirmation would require a detailed contextual analysis (cf. Part 4), for which I’m unfortunately the wrong kind of linguist. Texts are very likely to reveal the culture and politics of the time of their creation whether they intend to or not. This shows the clearer the further back in time you go. Whenever there are written sources, especially spanning several centuries, there’s the potential for information loss or textual corruption due to multiple reasons. They could be artistic (literary devices or comparisons that are clear to the original audience but lost to subsequent ones) or scribal (accidental or willful changes due for example to moral, religious, or political objections), or they could be environmental (poor storage conditions, damage during transportation, insect or rodent damage) or catastrophic (fire, flood, war). Or merely due to changing political or cultural priorities and/or forgotten lore. And that makes for great potential for plot points or drama. In The Lord of the Rings, for example, Tolkien included problems in the study of ancient texts into the plot: the One Ring was referred to cryptically as Isildur’s Bane (literary device) and its existence was eventually buried in old manuscripts in Gondor (forgotten lore). And thus some things that should not have been forgotten were lost. Translation issues, language change, or cultural change make tracking old documents and/or information challenging. For the right kind of book, another great source for plot! Acosta-Hughes, Benjamin. Arion’s Lyre: Archaic Lyric into Hellenistic Poetry. Princeton, NJ: Princeton University Press, 2010. https://books.google.com/books?id=5ZGm9MhhdDgC. Acosta-Hughes, Benjamin and Susan A. Stephens. Callimachus in Context: From Plato to the Augustan Poets. Cambridge: Cambridge University Press, 2012. https://books.google.com/books?id=aXdsdo0u__gC. Clayman, Dee L. “Berenice and her Lock.” Transactions of the American Philological Association 141, no. 2 (2011): 229-246, https://muse.jhu.edu/journals/apa/summary/v141/141.2.clayman.html. Clayman, Dee L. Berenice II and the Golden Age of Ptolemaic Egypt. Oxford: Oxford University Press, 2014. https://books.google.com/books?id=VjTLAgAAQBAJ. Harder, M. Annette. Callimachus: Aetia: Introduction, Text, Translation, and Commentary. Vol. I: Introduction, Text, and Translation. Oxford: Oxford University Press, 2012. https://books.google.com/books?id=a5YdwJJatoAC. Harder, M. Annette. “Callimachus.” In Space in Ancient Greek Literature: Studies in Ancient Greek Narrative, edited by Irene J.F. de Jong, 77-98. Leiden: Koninklijke Brill NV, 2012. https://books.google.com/books?id=efoxAQAAQBAJ. Harrington, Karl Pomeroy (ed.). The Roman Elegiac Poets. New York: American Book Company, 1914. https://books.google.com/books?id=mCwOAAAAYAAJ. Jones, Prudence J. Cleopatra: A Sourcebook. Norman, OK: University of Oklahoma Press, 2006. https://books.google.com/books?id=GQZB28EegT4C. Pinder, North. Selections from the Less Known Latin Poets. Oxford: Clarendon Press, 1869. https://books.google.com/books?id=n99GAAAAIAAJ. Talbert, Richard J.A. (ed.). Barrington Atlas of the Greek and Roman World. Princeton, NJ: Princeton University Press, 2000.